The size of Grand Piano that is generally used is in the range of 5-7 feet whereas the Baby Grand Pianos are the smaller version of these Grand Pianos. The significant difference between these two pianos is the Size. As concert pianos are much larger, this type of piano is used by professionals in events. Generally, people look for more convenient and smaller pianos and are often confused as of which piano to buy. 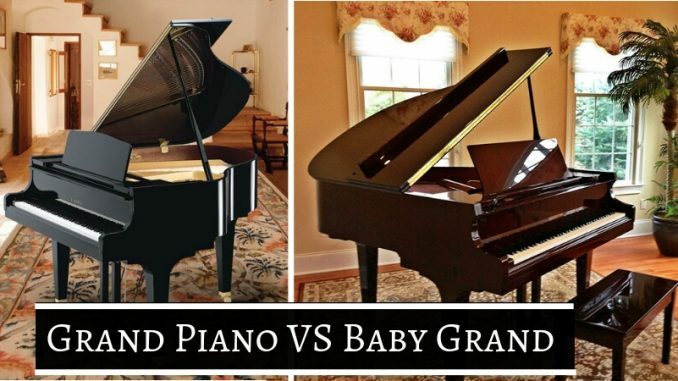 Here, you can see three major factors of grand piano vs baby grand piano. As the size of the Grand Piano is larger than baby Grand Pianos, Grand Pianos tend to occupy a lot of space. Grand Pianos are also called the living room pianos as they can fit in the room of 15×20 foot. Whereas the Baby Grand Pianos can fit in smaller rooms and compact areas. One can decide the type of Piano to be purchased depending on the space available for keeping the piano. If you are a professional pianist and are looking for buying a good Piano, then Grand Pianos make a better choice as the strings of the are lengthier and give deeper, louder sound as they have a larger surface where the sound resonates comparatively. As the size of the Baby Grand Piano is smaller, the strings in the piano are shorter which gives less loud tones due to their smaller surface area as compared to the Grand Pianos. If you are a beginner and have just started to learn to play the piano or someone who is proficient in playing piano but only plays it occasionally in leisure time, then Baby Grand Piano is the best choice for you. The primary factor in determining the type of piano to buy is the price or the cost. If you are looking for a piano that is budget friendly and affordable, you should opt for Baby Grand Piano. The price range is under $3000and can go up to $8000. Whereas Grand Pianos prices are more than that of the Baby Grand Pianos and can go from $50,000 to $80,000 depending on the size and condition of the piano. It is essential to maintain optimal temperature and moisture in the room where the piano is kept; the temperature should not exceed 72 F.
The Humidity of the room should be in the optimal range of 40%-50%. Once bought, pianos should be kept in an insulated space to protect it from dirt and dust. Keeping all these factors in mind, one can decide which piano is suitable for them. Other factors such as Maintenance, Warranty period and Guarantee should also be kept in mind while making this purchase. As a beginner, Baby Grand Piano is the best choice for someone, but if a professional wants to make a purchase, then it is best to buy a Grand Piano as it will be a good investment in the long run. In conclusion, all of the factors mentioned above should be first considered before buying a piano.